After acquiring N62BS, I had the wonderful opportunity to fly the airplane from its previous home near Sacramento, California all the way across the United States to Allentown, Pennsylvania. The combination of a new, unfamiliar airplane along with changing weather conditions and the promise of crossing the continental divide at night would definitely require thorough preparation. This would be the longest flight I had ever made in a single-engine airplane and I spent several weeks preparing for what would be a very memorable two-day journey which I have detailed below. I had originally planned to depart from Mather Field (KMHR) in Sacramento by 11:30am. However, things just seemed to take longer than I had anticipated. The pre-buy inspection had been completed the day before, but there were just a few maintenance issues I wanted resolved before departing. Finally, the airplane was fueled and ready for departure and I was airborne by 12:30pm. For several days prior, I had been carefully watching the weather trying to determine the best flight path to get over or around the Rockies. The shortest path to Pennsylvania would take me directly over the Wasatch mountains just east of Salt Lake City, Utah and then over the Rockies. Due to a significant line of weather running north to south over the Rockies, maintaining VFR would be difficult if not impossible. The minimum enroute altitudes for IFR flight in this vicinity are 13,000 feet or higher, requiring oxygen which I did not have on board. It is for this reason that I chose to take the southern route as depicted to the right on FlightAware. I was fortunate to have a very experienced Bonanza pilot with me on this trip. Randy Africano, who was responsible for managing the acquisition of N62BS, agreed to accompany me on the trip from California to Pennsylvania. Randy has over 4,500 hours logged in Bonanzas alone, and was a wealth of knowledge. I filed IFR and the departure from Mather Field was uneventful. The Bonanza truly is a dream to fly and has such a solid feel to it. The flight down the central valley of California was in VFR conditions providing an ideal opportunity to get familiar with the airplane before venturing into IMC. I climbed up to my filed altitude of 11,000 feet. As the flight progressed, cumulus clouds began to build off to the east of our flight path. Upon reaching the Palmdale VOR, we turned east and shortly thereafter were in IMC. Over the Aquarius Mountains just north of the Bagdad 1 MOA, I started to pick up rime icing. After accumulating ice for about ten minutes, I was cleared up to 12,000 feet and broke out above the cloud layer. Despite the weather, the ride was smooth at altitude with only a few bumps until the descent into Winslow. With the airport in sight, I cancelled IFR. Winslow was reporting winds out of the south at 28 knots gusting to 35 knots – sporty winds for my first landing in the Bonanza! The first landing attempt on Runway 22 ended in a go-around followed by a very firm landing on the second attempt. Not exactly what I was hoping for on the maiden flight! We refueled at Wiseman Aviation and grabbed a quick bite to eat before heading back out to the airplane for the next leg of this fun adventure. A strong weather system was running from Canadian border all the way into Texas with some additional localized weather over New Mexico. This leg of the trip was the one that made me the most uncomfortable. Had I been alone, I would have just waited until the morning to depart. I am used to flying high-performance multi-engine jet aircraft with all-weather capabilities. The idea of single-engine IFR over unhospitable terrain in an unfamiliar airplane at night was just too many risk factors to make me feel warm and fuzzy. Randy, on the other hand, felt right at home with these conditions having spent many years in similar circumstances flying freight. So, I planned a route to Liberal, Kansas (KLBL), filed IFR and blasted off. Once airborne, I contacted Albuquerque Center and picked up the clearance. Within an hour or so of departing Winslow, it was pitch black. Even when not in the clouds, there was no differentiation between the ground and horizon. The ride was rough in places, but the good news was that the groundspeed was consistently 195 knots or better! As we approached our destination (Liberal, KS), it occurred to both Randy and I that the FBO would be closed by the time we landed. Rather than deal with this inconvenience, we decided to continue on to Wichita. One of the benefits of ADS-B is nearly up-to-date weather and radar in the cockpit. Randy had suggested I buy the ForeFlight Scout prior to our trip and it was an extremely valuable tool in helping to avoid the weather. The conditions were changing rapidly in Wichita as we approached and the combination of the Scout and ForeFlight were extremely useful. I landed on 19L, this time without much fanfare. Certainly not a greaser, but my first night approach and landing in the Bonanza was definitely much more stable and controlled. We taxied over to Yingling Aviation where we were informed that our arrival timing was very good. Apparently the storm that was just now to the east of the airport had brought with it very strong rains and winds that took off one of the hangar doors! Yingling took great care of us, by reserving a room at a neighboring hotel and driving us there in short order. The next morning, I reviewed the weather carefully and planned the route to Gary, Indiana (KGYY). Randy lives in Chicago and our original plan was that I would drop him off at Gary and then fly the final leg solo. There was still significant weather just to the east of Wichita, which would require a bit of deviation, so I just filed direct knowing that I would need to deviate once airborne. Taking off from Wichita brought back fond memories of flying the Canadair Regional Jet for SkyWest Airlines. I have numerous entries in my logbook for this airport back when I was based out of Chicago O’Hare. After departure, I requested a course towards Cedar Rapids, Iowa which would keep me just west of all the weather. Once I crossed into Iowa, I was able to start heading east towards Gary. Chicago Center cleared us for the Lucit One Arrival into Gary. Runway 12/30 was closed at Gary due to some work, which meant that I would have to land on the much shorter 3,604 foot runway 02/20. I reviewed the GPS RWY 2 approach and briefed for LNAV minimums due to the non-WAAS GPS. The MDA is 1,040 feet, which is 449 feet above the touchdown zone elevation. The ATIS was reporting a 500′ overcast with 1 mile visibility – right at minimums for the approach. As we approached Lucit intersection, the ATIS was updated to 400′ overcast with a 1/2 mile visibility in fog. At this point, I told Chicago Approach that I would need to divert to Midway. Approach asked me what my current speed was and I told them 150 knots. They then started vectoring me for the ILS 4R and asked me to maintain 150 knots. Once the localizer had been intercepted ATC requested that I maintain 120 knots to Citgo, the Final Approach Fix. I was in my element and the Bonanza performed flawlessly. Flying approaches at these speeds is very comfortable to me because these are the speeds I routinely flew approaches at in the CRJ. Flying the approach felt very natural at this speed in the Bonanza and once I hit the marker, I dropped the gear, completed the landing checklist and finished off with a beautiful landing that put a big smile on my face! We taxied over to Atlantic Aviation, which was one of the busiest FBOs I have ever seen. I took this photo of N62BS on the ramp before being told by the ramp agent that it is against the law to take photos on the ramp of any airport within the Chicago city limits due to privacy concerns. Shortly after our arrival in Chicago, some adverse weather moved into the Chicago area, so we decided to just wait it out for the next four hours. Despite the original plan of dropping Randy off in Chicago and continuing on to Allentown myself, I asked Randy to continue on with me to Allentown. I knew there would be some weather to deal with between Chicago and Allentown and I thought it would be prudent to have a second pilot along for the final leg home. The departure off 4L from Midway was uneventful and we were cleared via the Midway 3 Departure which offered a scenic view of downtown Chicago off the left wing. 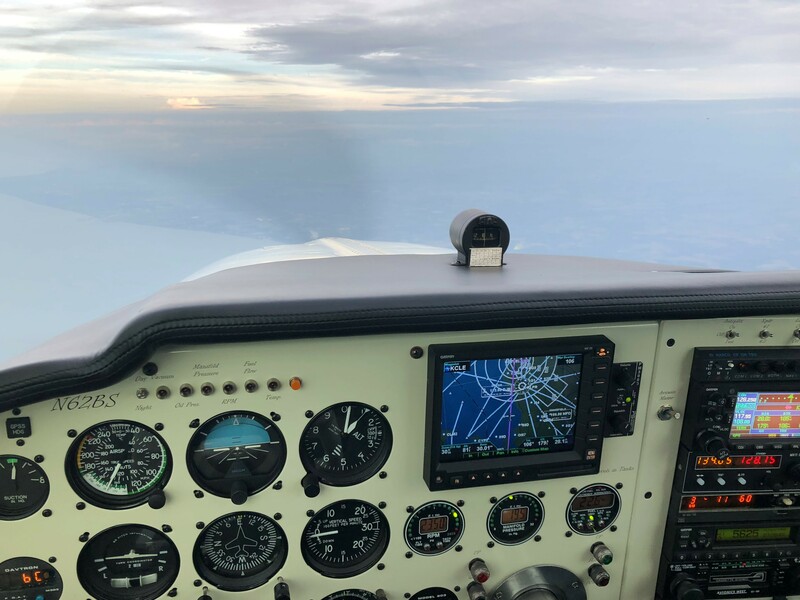 We headed out over Lake Michigan and Randy expressed some apprehension about being in a single-engine aircraft over the water. Despite all of the weather, icing, turbulence, night IFR over mountains, etc., this was his achille’s heel. No sooner had he made this comment and the engine missed a beat – just one little beat, as if to agree with Randy. It was probably some extremely mild contamination in the fuel as it never occurred again. However, it prompted Randy to key the mic and ask for a vector closer to the shoreline. The rest of the flight was uneventful as we flew in and out of the clouds as the sun set, which provided for some beautiful colors within the clouds. We had to deviate around a few isolated thunderstorms, but for the most part, the flight was smooth and we had about 25 knots of tailwind. As we began the descent into Allentown, some weather was just passing over the airport. By the time I landed on Rwy 6, the weather had moved east of the airport just leaving a nice fresh coat of water on the runway. This experience is one that I will remember for the rest of my life. It was a fantastic opportunity to put the Bonanza through its paces and get to know the airplane. I was also fortunate to be accompanied by Randy, who was a wealth of knowledge. I now get to look forward to many years of enjoyment as I travel to new places with my family in N62BS.